I have been busy working on a few paintings. Still working on the cherries but I did complete this small study of northern wild flowers in pen & ink and watercolour. Of course there is still about 4 feet of snow here. It usually starts to melt in April. So it will be a while until I can go out gathering flowers to bring home to paint. I used some photographs to paint this little group, even though I was not able to go into nature to gather these ones I still like to paint a group of flowers that are from a similar habitat. Starting on the left the yellow flower is Arnica, which is a very widely used medicinal plant. In the middle is Pink Wintergreen, called "winter-green" because it is one of the only brave little souls that keeps it's green leaves all year round even when it is buried deep beneath the snow. And the flower on the right is a purple Marsh Violet. I always get so excited when the violets come out in May here. They are one of the first wild flowers to bloom. Other common violets around here are the yellow Stream Violet and the Early Northern Violet. Anyway I like to sneak in a few flower paintings in the winter while I am waiting with baited breathe for spring to arrive. Right now it is -10 degrees outside, not too cold. However currently the furnace is out thus I have had no heat in the house since yesterday. And believe it or not there was a bad accident on the highway on Friday that knocked out an important telephone pole. So now there is no cell phone service in town. No heat, no phone, I might as well be homesteading. I am sitting here in my wool coat at the computer hoping my landlord got my message I left for him via the public phone at the Rec-center. I guess I should really get a home phone line, I never thought there would be no cell service for 3 plus days. Originally the internet was knocked out too, but luckily by some miracle it is working now too. Oh well nothing to do but wait for all this to get fixed, so might as well keep on painting. I think I might create a greeting card design out of this painting. If so I will list it in my Etsy shop. 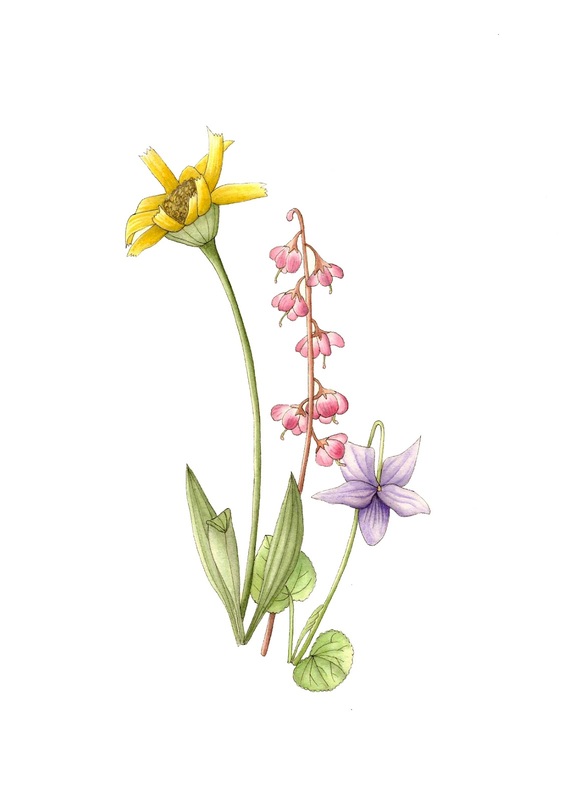 Do you keep track of the wild flowers in your local area? If so what types are the first to bloom in the spring? Oh my gosh, that's awful! Hope you are staying as warm as possible and that everything gets fixed soon. At least you have art and the internet to keep you entertained while you freeze! Lol, yes I know it really was horrible! Funny but you do not feel like doing much when you are so cold. I was starting to do housework to keep moving....how dramatic. Luckily I just got it fixed a friend came over and got it going for me! Oh to be WARM again. Well at least something good like housework came out of it haha Glad you got it fixed! Anyway, love the flowers. Before I even read the post, I thought to myself that it would make a perfect greeting card! Yes this whole no cell phone thing has really got me thinking about all the "homestead survival" groups that have sprouted up every where since 2012. A home phone line is probably a good idea. Yes I look forward to producing some greeting cards from this painting, glad thats what you thought too! thanks for visiting my blog - following you back!! your drawings are lovely - looking forward to following along!! I know some wildflowers we have, but not a lot. We have lots of lupines here. This painting is so pretty. It would be such a lovely greeting card! Yes I am looking forward to getting the greeting cards made. We also have Lupins here they are so lovely. I did a drawing of one last summer but have not gotten around to a painting yet... maybe this summer :) Love your blog! This is lovely. As much as I love nature I've just never been one for drawing/sketching/painting, so instead find myself with a camera at hand! Thank you so much for stopping by and I'm extrmemely delighted to be your newest follower! Please let me know if you're looking for a author for your site. You have some really good articles and I feel I would be a good asset. If you ever want to take some of the load off, I'd absolutely love to write some material for your blog in exchange for a link back to mine.